The College of Catholic Church Music & Musical Education (HfKM) is well known for it’s top-quality education and is the oldest institution of its kind in the world. By participating in the event of the short film week, sudents and professors face the challenge to add something new to selected shorts. 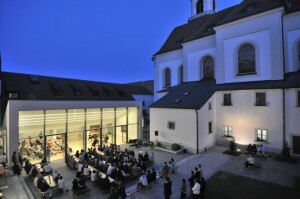 Wether an improvisation on a church organ or sophisticated percussion – everything is possible at the concert hall!